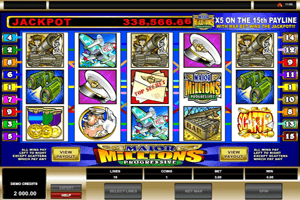 Major Millions is a fun and an exciting progressive slot machine that has the ability to reward players generously. It has a progressive jackpot that keeps on increasing whenever players place bets on the game at any casino. This is why the jackpot amount that is written in red at the top keeps increasing with every passing second. The game also has an exciting theme as it invites players to accompany Major Millions in his war escapades as he commands his troops on land and in the air throughout the war. Play Major Millions Slot here. All of the symbols are inspired by war, they include a tank, top secret file, air fighters, Major Millions himself, the Major’s accolades, binoculars , money stacks, golden coins and much more. They appear scattered on the 15 lines of the game and its five reels. Apart from the progressive jackpot, players will also earn handsome rewards through the line payouts that the game has in store. Players can check out these pays by opening the paytable of the game. It will also show them the different bonus rounds and symbols. There is the Major Millions logo which acts as a wild icon that will also triple the rewards. Players can also trigger the progressive jackpot of the game when 5 of these logos appear on the 15th payline of the game.